Now the main concern is, why we need ASP.NET Core ? or why to use it ? What are its advantage over ASP.NET ? Now a days Web applications are not just limited to Desktops and laptops, it moved to smart devices, cloud apps, mobiles and IoT's, additionally it moved to other platforms too (Linux, Mac). To serve all these (basic) needs we need ASP.NET Core. Basically ASP.NET Core is no longer depend upon system.web.dll It has inbuilt set of NuGet packages in it, which allows to optimize the App size, performance, security and rapid development, so inshort we moved to 'pay-for- what-you-use' theme. Surely .NET is a stable and consistent framework, serving millions of web applications over a decade. It is ready to use framework with millions of preloaded libraries, Still there are some flaws in it e.g. it only supports Windows, its large API collection leads slow down performance etc. Whereas .NET Core is it lighter than .NET framework, as it does not carry any API package, Just user need to install packages from NuGet and create customized app. It has a set of libraries called 'CoreFX' with a runtime called as 'CoreCLR', both libraries and runtime distributed through NuGet so user has to download it as per their requirement. Running code on .NETCore is really easy, Just you need to Install .NET Core SDK --> Initialize some code --> Run the app --> you are done. Data Security Expectation is simple, my data should be secure between server round trips, even if there is a un-trusted client call. so after server round trip server should have assurance that data is untouched. in short we need a Authentic data transfer. Due to modularization and customizations development technique, components are re-used anywhere regardless of the system, here we need to ensure that data not should get messed-up with each other. The things we used to encrypt data such as filepath, access permission, server side storage should be confident and should not disclosed to untrusted client. In simple words, the data security design should be Authentic, Secure, Simple to implement, Isolate from regular operations, Core logic should be hidden from developer. 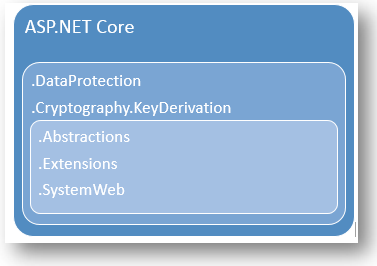 For data protection, ASP.NET core support both encryption and hashing technique. Now the question comes in mind, what is encryption and hashing ? If both are used for security then what is difference between encryption and hashing ? Hashing is the process if turning data in a fixed length of string or numbers, here, same input always generates same output. Once is the data is hashed it cannot be fetch back to original text. so we will never actual data that we have passed. Some popular hashing technique are MD5, SHA etc. The big difference between Encryption and Hashing is, we can create encrypted to plain text in encryption but we cannot to back to original text from hashed text. ** Have you notice one thing here? We have pass a string to 'CreateProtector' method, Do you know what that string indicate? it is call 'purpose string' basically it is used to create a isolated environment, e.g. if we create a protector with a string 'ABC' and protect a data, it cannot be unprotect same data with a protector created with string 'XYZ', so it is again a step forward to make data more secure. In above sample with the help of a salt and 'HMACSHA1' algorithm (1000 iterations) we have hashed a string to encrypted text. ASP.NET Core Encryption technique can be good to use at client state management technique like Querystring and Cookies, due to auto generation encryption key, it plays a secure role. ASP.NET Core provides a protection API that helps us to encrypt data using Encryption and Hashing technique, additionally for encryption, key is created and maintain by system itself so outside interference get blocked and data get more secured. Data security is not a single cup of tea, there are lot to discuss and share, we will cover it in articles till then Enjoy this Encryption and Hashing points and get secured.